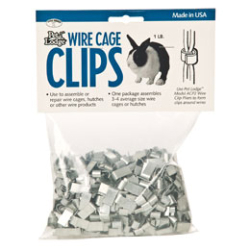 These handy metal clips are designed for assembling or repairing 14 to 16-gauge wire panels for rabbit hutches, pet homes, and other wire products. The ferrule-type clips wrap around wire or other material to fasten it together. Great for many uses around the farm, home, and shop.